“You are the salt of the earth… You are the light of the world. Jesus said that “you” are the salt of the earth and the light of the world. Who was He speaking to? He was speaking to His people, to every Christian man, woman, and child. 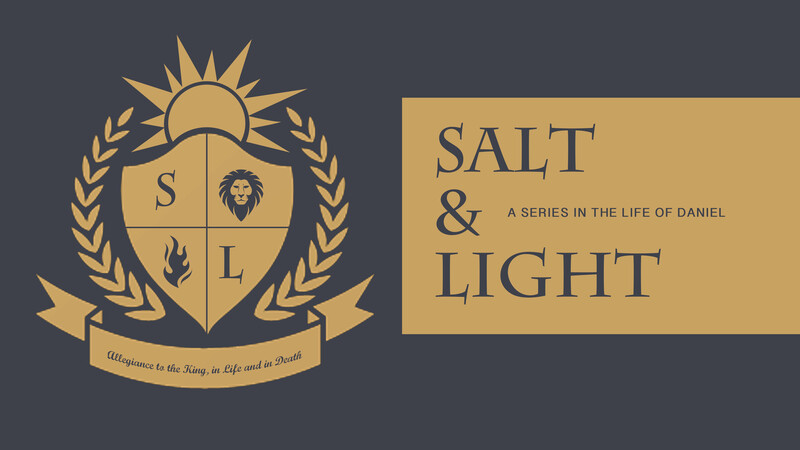 But what does it mean to be salt and light? Is it our attitude, our actions, our beliefs, our speech, or our demeanor? Yes, and much more. Salt and light refers to our identity and our influence on the world around us. To understand what Jesus means when He says that we are the salt of the earth, we need to understand what salt does. In the ancient world salt was primarily a means of preservation, it prevented decay. This is what Jesus is calling Christians to do, to prevent the decay of society. How do we do this? By speaking and acting against all that is not right in the communities that God has put us into. Jesus calls us to stand up for the rights of the fatherless, the widow, and the foreigner and to prophetically speak against injustice and corruption. Jesus calls us to expend ourselves by being rubbed into and infiltrating society, not only to help those who have been hurt by injustice but also to work to build social structures that honor God and bless people. We must be courageous and stand up for what our Lord says is right even when it costs us because of deep-rooted and established systems set against God’s kingdom of righteousness. Our saltiness is caustic and painful to the world not because we are called to be rude or unkind to sinners but because of its countercultural nature, it is antithetical to the world’s deepest desires. John Stott wrote,“So Jesus calls his disciples to exert a double influence on the secular community, a negative influence by arresting its decay and a positive influence by bringing light into its darkness. For it is one thing to stop the spread of evil; it is another to promote the spread of truth, beauty and goodness. May God give us the courage and the love to be what He has recreated us to be to a world that desperately needs us. Jesus said that we are salt and light. How are these things complementary and why are both necessary in the world? How can you be salt and light in your job, your school, or your home? What is the effect on our communities when we as Christians refuse to be salt and light? Read Daniel 1:1-4 and work together as a family to describe what has happened to the tribe of Judah. Where are they? Why? Continue reading verses 5-21 picturing yourself next to Daniel as he speaks. In verse 8, what does it mean that Daniel “resolved” that he would not defile himself with the king’s food or drink? In the same verse, how does Daniel follow through with what he resolved to do? Take turns sharing examples of situations that call for resolving in your heart to obey God and then acting on it. What would it look like for you to follow through with your decision to obey God? Conclude your family worship time by thanking God for His faithfulness to each person here, and ask for the courage to remain faithful in obedience when you are faced with uncertainty and hardship. Praise Him for specific evidences of mercy you have witnessed, and invite your kids to make requests or offer praise in the same way.